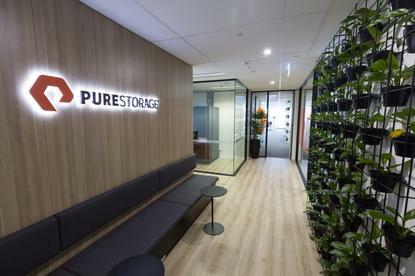 Flash storage vendor Pure Storage opened its new Australia and New Zealand headquarters in Melbourne, which is three times bigger than its previous location. The new office allows the vendor to grows its headcount and serve existing and new partners, and customers. Pure Storage was unable to confirm its local headcount. “The enterprise flash-storage industry is rapidly evolving. While other players are getting swallowed up whole, we’re growing and expanding," said Mike Sakalas, vice president A/NZ at Pure Storage. "Being based in the tech capital of Australia will allow us to increase our foothold on the local market by continuing to help current and future customers put their data to work to unleash the power of emerging technologies like artificial intelligence and machine learning." Pure Storage was established in 2009 in the US, with the company landing in Australia in 2013. Minister for innovation and the digital economy Philip Dalidakis said the vendor will play an integral role in growing the state’s digital economy by helping Australian businesses maximise the value of their data. In May, the vendor unveiled its new channel partner program, which has two tiers and a host of fresh training, certifications, support, standardised discounts and incentives. While the program is designed to enable partners of any size the ability to achieve top tier status, the so-called Preferred tier is the entry level tier for all partners. The top tier, Elite, is invitation-only, based on whether partners have successfully established a Pure Storage practice consisting of demonstrated sales and technical competency and business specialties and services.